Winter is upon us. As we humans hunker down indoors with a warm beverage and a blanket during the long dark nights, many of our resident animals are quite active this time of year. 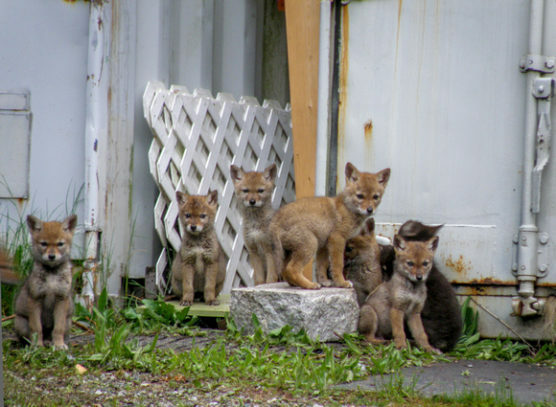 January and February is the breeding season for coyotes across Vancouver. On a winter night, coyotes are often heard barking, howling, and yipping as packs communicate with each other while establishing territories, competing for mates, and keeping in touch during this busier season. Generally speaking, coyotes tend to form monogamous pairs. These bonds are strong and are often only broken by the death of one of the pair. These alpha pairs, along with a couple of subordinate coyotes, form their pack structure. Female coyotes only enter estrus once a year during the winter, and during this period, only the alpha pairs will mate. This time of year, it is important to keep our dogs on a leash and cats indoors. When enjoying the outdoors, keeping your pets near you can prevent unwanted interactions with a coyote. If you do come across a coyote, be big, brave, and loud. Hold your arms out, stand your ground or slowly walk away (but never run), and yell, “Go away coyote!” Then, report your sighting online or by calling (604) 681-9453. Coyotes are naturally timid animals, and scaring them is for their safety. Most people agree that our urban wildlife—including coyotes—enhances our lives in the Lower Mainland. 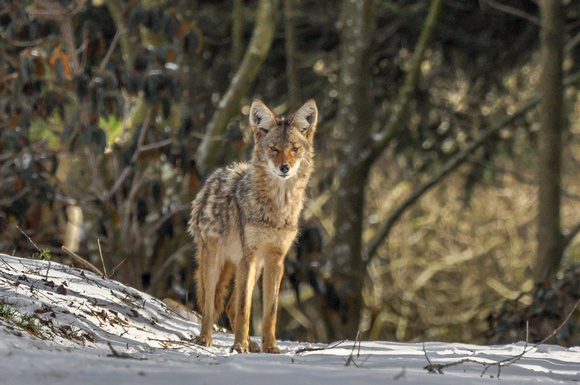 Coyotes perform ecosystem services for us including preying upon unwanted rats and mice. If we do our part to keep them wild by not feeding them and removing food sources around our homes, we can peacefully coexist with these urban-adapted animals.